Our Mission at Burnaby Endodontics is simple: to take exceptional care of you. Drs. Chris Siu and Wei Qian and staff have a "make no compromises" philosophy. Our endodontists will alleviate your pain and symptoms and provide the finest quality root canal treatment. We will accommodate you immediately for any emergencies that you may have. Our office has state of the art equipment and we use the most up to date materials. Every procedure is performed with the use of an operating microscope. Our office is located in the heart of Greater Vancouver, in Burnaby, beside Metrotown, on the corner of Nelson Avenue and Bennett Street. Please feel free to contact us if you have any questions at 604-566-9978. Please click here for a referral slip. 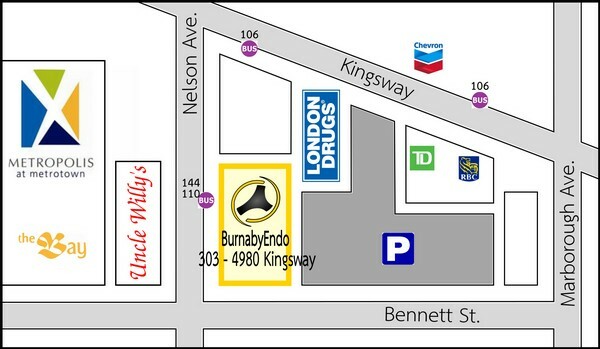 Our office building is located behind London Drugs. Please pay for the parking at the meter and bring the parking receipt to us. We will be happy to reimburse you the money.